Do it yourself projects are increasingly gaining popularity and with the rise of websites like Pinterest individuals from all over are determined to invigorate their creativity and challenge themselves with all kinds of projects. While there are numerous DIY projects that you can choose to try out, as plant specialists we can help guide you through some fun and fairly simple indoor plant design projects. Whether you have some plants lying around the house that you wish to re-organize or if you are looking for unique arrangements for your home we are here to help and inspire by sharing our favorite top 5 DIY indoor plant design projects. A stunning green living wall has become a form of natural wall art as well as a popular trend in homes all around the world. Are you interested in learning how to create this vibrant green living wall on your own? A DIY living wall project is fun and fairly simple and it allows you to choose the plants you want to install in the living wall as opposed to buying an already completed living wall. You can choose to plant succulents, fragrant flowers, herbs and various other indoor plants. You will need to purchase a panel made out of wood or plastic in which you will plant your living wall. This panel should have a collection of small planter cells where you can place individual plants. When choosing plants for your green living wall make sure the plants all have similar light and water needs. Once you have your wall panel and your plants get creative and arrange them as you please! Hang the panel, water as needed and enjoy your stunning new green living wall. Terrariums are perfect for those of you who live in areas with extreme weather conditions, such as the hot and dry heat of Las Vegas. The best way to enjoy plants in places like this is to bring them indoors and to place them in creative containers. Terrariums are among the easiest DIY indoor plant design projects and they are extremely popular. All you need for this project is a glass container, your choice of plants, potting soil, moss and whatever decorative pieces you wish to include in the design. You can create multiple mini terrariums and group them together or you can pick a big glass container and fill it up. When putting your terrarium together place the pebbles at the bottom for drainage then place the soil over it. It’s a good idea to mix this with activated charcoal to protect your plants from disease and odors. Once the soil is set up arrange the plants and leave about an inch between each plant. Add moss around the plants and any decorative touches you wish. Place in an area with adequate sunlight, water and enjoy! Traditional planting pots are going out of style and creative individuals are quickly coming up with new ways to plant indoor plants. The container you place your plants in is just as important as the plants you choose. A fun DIY project for indoor plant design is to create your own containers. You can recycle plastic bottles, wine bottles, mason jars, tin cans, deflated volleyballs, old chairs and just about anything you can think of. A creative container adds character to your indoor plants and the design. There’s nothing better than planting with fresh herbs, and an indoor herb garden not only looks good and smells good, but it will take your cooking to the next level. All you need is as many mini terra cotta flowerpots to plant as many herbs as you wish. You will also need a wood board with holes cut out for the mini pots. You can either purchase a ready-made planter to hang or make one yourself. Once the set up is done you can plant whatever herbs you want such as mint, rosemary, oregano, basil and more! Your plants will need to be watered while you are away and what better way to take care of their needs than to make a DIY plant watering system. This may sound complicated, but believe it or not all you need is a plastic bottle for each plant. 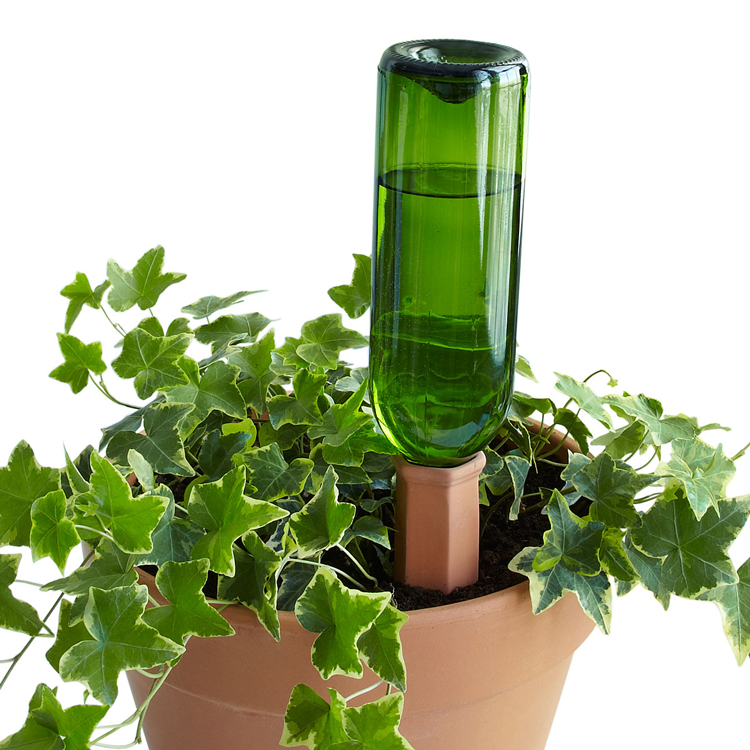 Before you install the bottle in the soil of your houseplant make sure the planter is already saturated with water. Fill up the bottle with water and insert it into the soil – make sure the opening to the bottle isn’t blocked by dirt or soil. This solution is best for short-term trips that don’t last more than five days. Whether you are a veteran gardener or just beginning to nurture your green thumb, these DIY plant design projects will keep you busy, stir up your creativity and add a unique touch to your indoor spaces. If you have any questions about your indoor plants or if you’re looking for plant design inspiration for your home or office contact us at Interior Gardens – we would be more than happy to assist and answer all of your questions!